We sell Melbourne’s most extensive range of trundle beds, available at our Altona outlet. Noddy’s Beds want nothing more than our beloved customers to get a good night’s sleep, every night. Therefore, we pride ourselves on selling high quality, super comfortable beds and mattresses that will give you that perfect sleep you may have thought eluded you. We sell all our beds at discount prices as we don’t believe that having a great sleep should cost an arm and a leg. 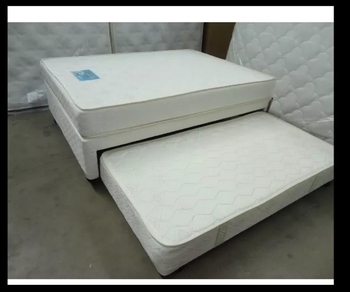 We sell a great range that includes king size, king singles, queen beds, singles, and doubles. We are proud providers of the best range of mattresses available in Melbourne, and we’re sure that you will love our low prices on our great selection. We deliver our mattresses throughout Melbourne and to Sydney. Sometimes there just isn’t enough space in your room for a full sized, stationary bed. Whether you’re looking at saving space in smaller rooms, or if you regularly entertain guests, our trundle beds are perfect for anyone that wants the convenience of having a comfortable bed without permanently losing the space. When you are not using them, the trundle simply stores underneath the bed and effortlessly pull out when needed, giving you freedom in your room design while keeping the convenience an additional bed provides. If you are interested in learning more about our range of trundle beds, or about any of our extensive collection of mattresses and bed bases, feel free to get in contact with the friendly team of staff at Noddy’s Beds. We are dedicated to providing an exceptional standard of customer service for our valued customers, and are always happy to discuss our range of beds. Fill out an enquiry form on our contact page or give us a call on 0434 540 290 and we will be happy to assist you with any enquiries regarding your brand-new bed from Noddy’s.